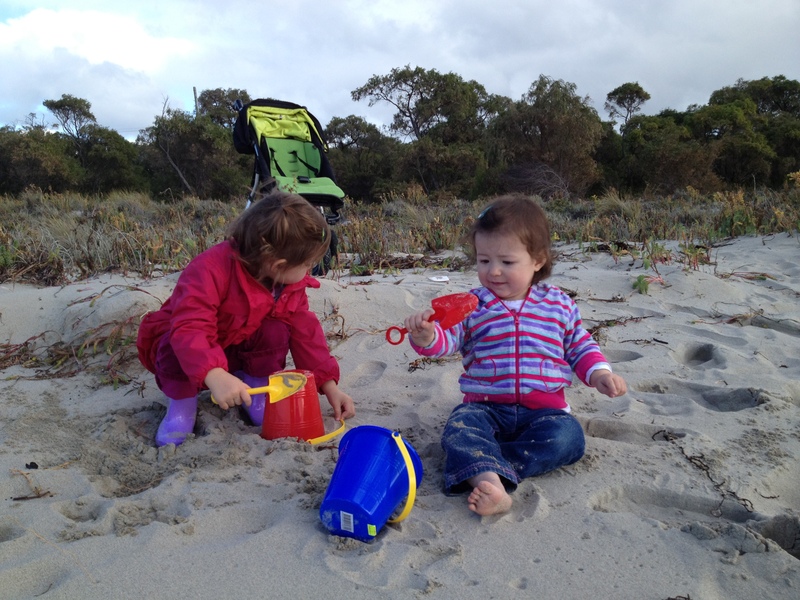 I have just spent a week away in Dunsborough with the family. Dunsborough/Magaret River area is one of the places where Mr and I went on a (fairly) regular basis during the ten years of marriage pre-kids. Yep, I know, you can picture it … wine, good food, relaxing, sleepy mornings, loads of books, and more good food and wine. So this time as we headed away, I (somewhat optimistically) packed my bag with a few books I’ve been meaning to read, a couple of magazines, and my journal (for all that writing I would do … you know on the beach, as the sun set, with a glass of wine in my hand). It would be so easy to mourn the loss of the halcyon days, but there is something about travelling with Miss 2 and Bubba Girl that makes you sit up and take notice. They live life large (and loud). They both got so much enjoyment out of digging sand on the beach and collecting shells, even on a rainy cold winter day. The simple pleasures of a Simmo’s ice-cream, or running on the lawn chasing daddy at one of the wineries. Just being together as a family was what they loved. So yes this holiday was one where I took more books than I read, and I did absolutely no writing, but it was one where our family lived large and loud … and funnily enough that gave me something to write about.